Old Florida Lumber works to collect and stock a wide range of antique and vintage lumber, including beams and joists that can add striking visual interest to any space. The processed inventory is available in-the-rough or with added value services of millwork and fabrication, as requested – including wire brushing, skip planing or surface sanding. In many instances, simple cleaning and/or application of a natural oil can often provide a warm revival of the woods without losing the rustic character. Visiting the yard and mill to look at the inventory first hand is possible during working hours. Please call in advance to schedule. In some instances, samples can be mailed or photos emailed. Quality reclaimed wood flooring and paneling begins with salvaging these woods from a wide range of 19th and early 20th century structures, of reclaimed old growth timbers. The raw lumber is then professionally milled and controlled for quality at each stage of production, resulting in a beautiful, durable product. Having endured the elements, these antique woods have accumulated the uncommon marks of long use to become extraordinary objects of nature and history. Each board has varied grain and color with character markings, which may include small knots, nail or bolt holes, and check cracks. The transformation to modern building material is a visually stunning statement within a space, as well as an aid to living forest preservation. Standard flooring is T & G, ¾” thick and random lengths. 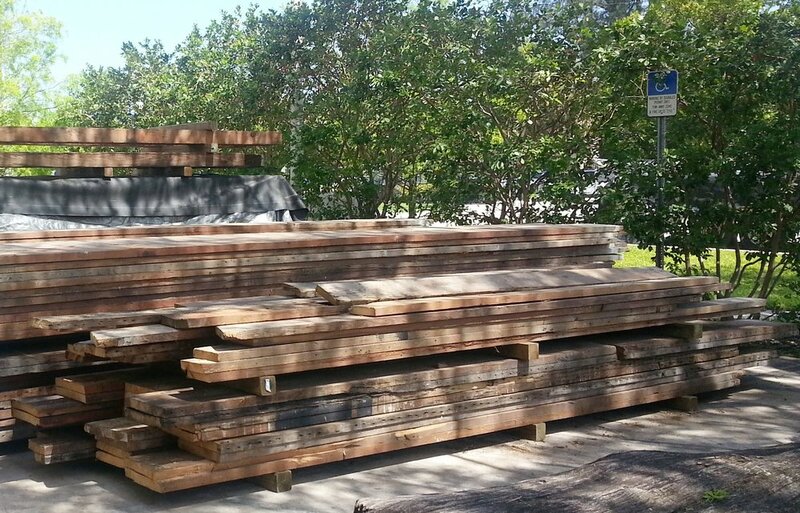 Most common reclaimed Dade County Pine widths: 2 ¼”-2 ½” and 3 ¼." Other thicknesses, widths and lengths are available by special order. Along with our flooring and paneling, we provide architects, contractors, and fine woodworkers with custom milled lumber for a range of building and design applications, including box beams, trim, moldings, doors, ceiling and wall paneling, wainscoting, built-ins and other applications. Old Florida Lumber has had the privilege of fabricating a large variety of custom statement pieces over the years. You name it, and we've provided it: reclaimed antique fireplace mantels, commercial and residential bar tops, bar stools, tables, desks, doors, gates, and trellises. Contact us today to discuss how we can help you create a lasting heirloom for your home or business.